Tottenham attacker Heung-Min Son is sad that he will be leaving the club as he prepares for South Korea's international pursuit in the Asian Cup. 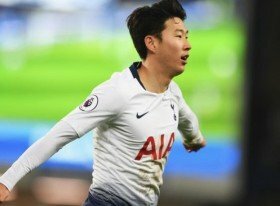 Son scored his 8th goal in 9 games during the 3-0 win over Cardiff City this week. The international star has been an important member of Tottenham's impressive start to the season in the Premier League and the Champions League. Son will miss at least five games for Spurs if South Korea can make it all the way to the final of the Asian Cup tournament. “Of course I feel very sorry because I miss already in September. I feel sorry for my team-mates, the fans and the coaching staff. It’s difficult. Sometimes you think it’s a bit sad, but it is also important for my country," said Son. “I hope I can keep my form for the national team and when I come back here again as well. "I was tired after the Asian Games because in that tournament it was playing after (every) two or three days." Son is likely to be replaced by Lucas Moura in the first team for Spurs.